Become an Honors Peer Educator! 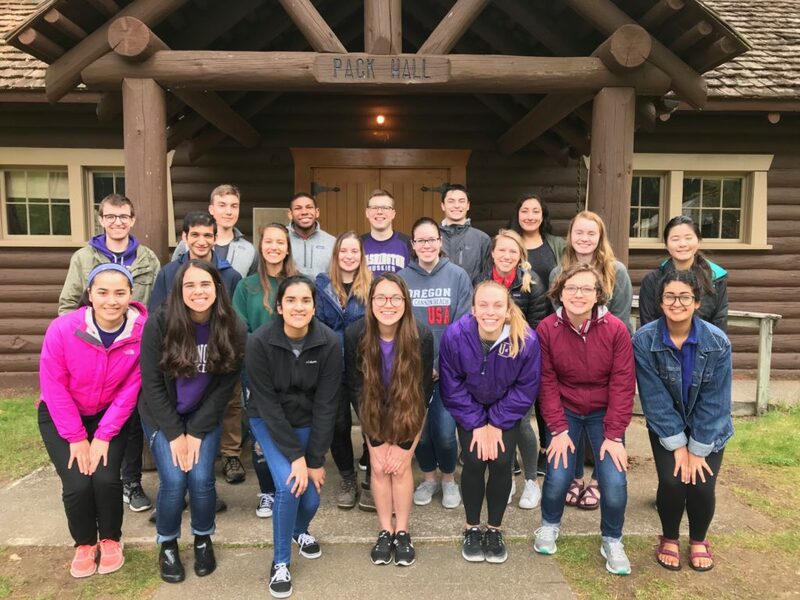 Peer Educators attend an overnight retreat in the spring to Pack Forrest, a UW owned conference center just outside Mount Rainer National Park. What does an Honors Peer Educator do? Honors 100 PEs are leaders in the Honors community by teaching a section of the Honors 100 seminar. They are integral in welcoming, mentoring, and informing incoming Honors students. PEs share insights about and experiences with Honors curriculum, community, and resources with new students. In addition to leading an Honors 100 section, during both Spring and Autumn quarters, Honors 100 PEs meet weekly with one another and with the Honors 100 instructors to develop their courses collaboratively and to discuss important questions and challenges related to teaching and mentoring. These meetings provide a supportive environment to discuss openly the successes and challenges of leading Honors 100 sections. What is required of an Honors Peer Educator? Creativity and enthusiasm for the supporting the UW Honors Program! Registration in and successful completion of Spring quarter HONORS 397 (Wednesdays 3:30-4:50pm, 2 credits*). This seminar course will help you develop plans for your sections collaboratively with the support of Honors advisers and your peers. Participation in our Spring Peer Educator retreat (Friday, May 3rd – Saturday, May 4th). Registration in and attendance of Autumn quarter HONORS 397 (Wednesdays 3:30-4:20pm, 2 credits*). This seminar bring all PEs together to collaborate and share ideas about their sections with support of the instructors. Attendance of all Autumn quarter HONORS 100 lecture sessions and instruction of all Autumn quarter HONORS 100 sections (Mondays OR Tuesdays, 3:30-4:50pm). Individual time devoted outside of class and meeting times in Autumn quarter for effective preparation of individual HONORS 100 sections. *Peer Educators now earn 4 Honors Additional Any credits (as well as general education I&S credit) after completing the Spring and Autumn quarters of Honors 397: 2 credits in Autumn, 2 credits in Spring. *Returning Peer Educators who have already earned 4 Honors Additional Any credits will only be eligible to receive 4 general education I&S credits (not Honors Additional Any) unless approved for Ad Hoc. Peer Educators learn how to teach a variety of topics relevant to incoming Honors students. 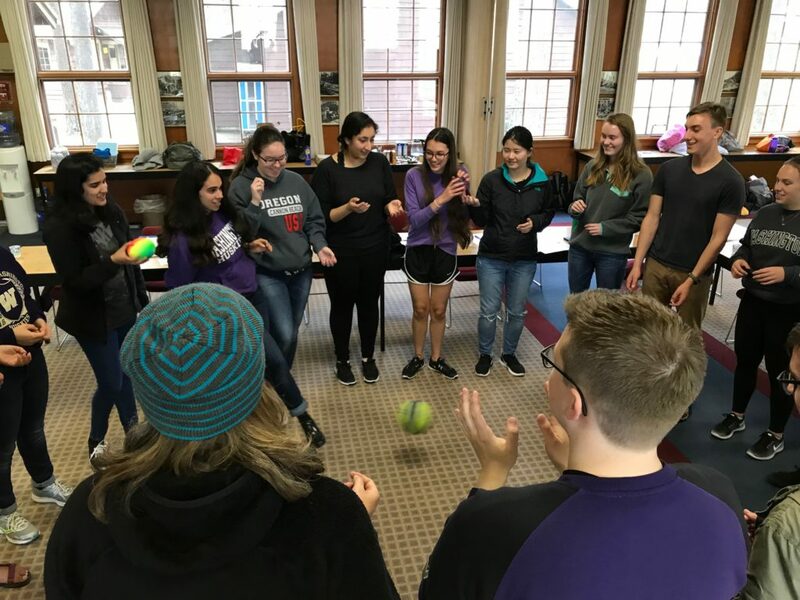 The Peer Educators pictured above are doing a time management activity that represents how things can feel chaotic if you are trying to do too much at once. The Honors advisers will review and respond to all applications in early February. If invited to proceed, you will attend a group interview in mid-February. All interviewees will be notified of our final decisions by late February, and will be required to confirm their participation and register for the Spring seminar. Successful completion of the Spring seminar is required to continue in the PE process. Meet the 2018 Peer Educators!